There can be only one Wildwoodz - and it's the best. 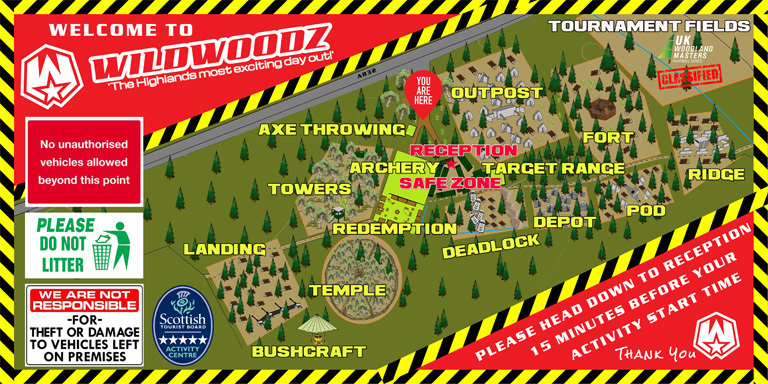 Wildwoodz has some of the UK’s finest paintball and lasertag maps. From the moment you walk through reception you’ll see the thought that goes into all our facilities. A true 5 star activities venue that should be your first stop on the North Coast 500. Please Note: The playing of any particular scenario map cannot be guaranteed in advance. The suitability of certain maps is dictated by many factors and is subject to fast unexpected change. Please trust that our staff are acting in the best interests of everybody present. It would be with a heavy heart that we’d take the decision not to play our most popular fields (we want to show them off), however safety is our primary concern. Scotland’s biggest Wild West Village scenario. Two and three storey buildings surround the town of Redemption. A stunning playing area to tickle the tastebuds of all gamers. Rob the bank, break prisoners out of Jail, steal some fresh horses. A mulitple scenario game area you just won’t want to leave. The post itself is protected from heavy vehicles by an arrangement of concrete tank traps. You’ll have to go in on foot. Can your team secure the ridge or will you risk letting your opponents have it? What are they planning on the other side of the hill and is your plan sound enough to survive it? An exhilarating playing area to test your tactics and teamwork to the limit. In the darkest part of the forest are the remnants of a native stockade. Send raiders across no-mans land to ambush and exterminate the opposition. Let none survive. Two sniper towers control the border crossing in the middle of dense cover. You can hear the bad guys just metres away- You just can’t see them. Sneaking through enemy lines will take every ounce of skill you have – Go for it! The escape pod is re-fuelling. Cut off it’s supply before it can launch. Defend the control bunker at all costs. An encampment has been discovered. Gain control of the communications centre to in order to preserve links with your superiors. Surround it from outside or guard it from within, only the best laid plans will triumph! Storm the artillery emplacement from the landing area. Outgunned? Outpositioned? Losses will be heavy but the position has to be taken at all costs. Be the best. Our tournament arena which is not out permanently – You may get lucky. The Wildwoodz reception and safe zone is one of the nicest and tidiest woodland venues you’ll visit. Wildwoodz Archery is the largest covered target archery range in the highlands. Bowtime whatever the weather. The Wildwoodz Axe throwing Alley is a purpose built timber target arena. Be more viking.